This photo was given to me, along with several other photos of my father and a photo of my Aunt Louise Doering Blum, her husband and two daughters of which are seen in the photo section of the Konrädchen story. It was twenty years ago when I contacted Alexander Fink the husband of my then late 1st cousin Lydia Blum Fink, to see if he had any photos of the Döring Family. He invited me to come over to his home and along with the pre-mentioned photos, gave me this photo that he said was thought to be a Döring family. Since my cousin Lydia was no longer living at that time, it wasn’t determined for a fact of just who this Döring family was. I can only assume that it was a Döring family since it had been in the possession of my cousin whose mother, my father's sister, was a Döring. 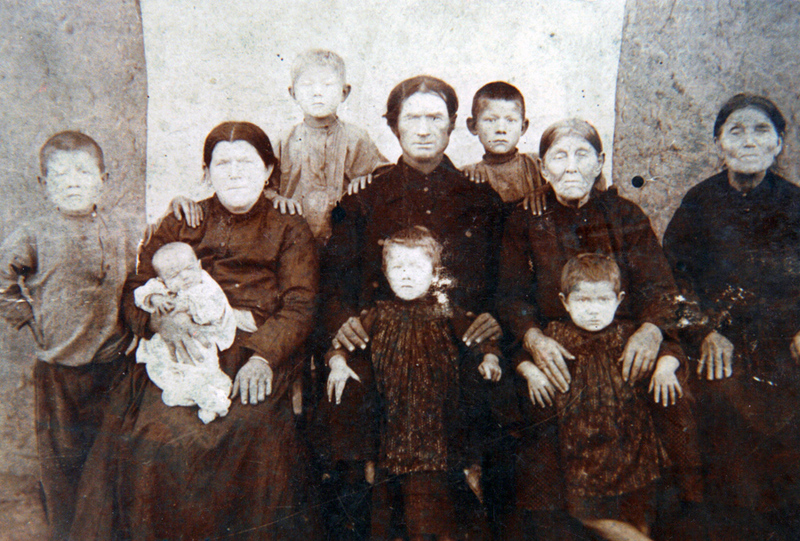 So for all practical purposes, this photo goes into the, “Can you identify this family, said to be a Döring family from Norka?” It appears that there is presumably a mother, father, six children and perhaps two grandmothers. I think its safe to assume that this photo was taken around the turn of the century. If you have any information about this photo please contact Roy Derring. Photograph of an unknown Döring family courtesy of Roy Derring. Information and photographs courtesy of Roy Conrad Derring, Portland, Oregon.